Where, oh where is The Nearsighted Monkey? I’ve been waiting for months. I keep trying to pre-order it, but it keeps being delayed. 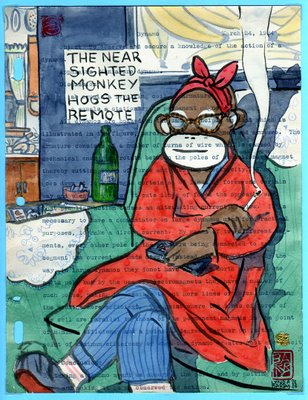 As a fan of Lynda Barry, and monkeys, and well, not cigarettes, but you get the idea: I am eager. WHERE IS IT? And now I read THIS and get confused. I thought it was supposed to be out in fall 2009. If you have any scoop, post here! I adore Lynda Barry. I will wait as long as I have to, but I just got another message from the online retailer where I ordered it, informing me of a delay. This is getting really tantalizing. Okay, of course the delay is not all about me, and I’m sure others are affected. And I suppose it would behoove me to get used to the delayed gratification of publishing…but more on that angle in another post. STAY TUNED. This entry was posted in Uncategorized and tagged delayed books, Lynda Barry, monkeys, writing. Bookmark the permalink. Just got word from Amazon. The book I ordered in May is due November 2010! In the meantime, all I can do is pine. Jim’s mom ordered it for my birthday last February, thinking it was coming out in March. Over tilme, it’s become a Seinfeldish source of angst for her. I keep telling her, yes I still want it, no please don’t worry, but having it pend forever, and the unnecessary but charming guit over not having given me my birthday present have irked her. Anyone with any scoop, please post here!